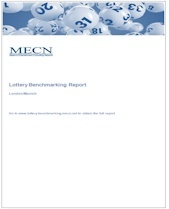 MECN is proud to present the new 2018/2019 edition of our study “Lottery Benchmarking Report”. The study again provides a wealth of information on lottery-specific industry benchmarks far beyond sales comparisons. The 2018/2019 edition again includes a large number of analyses of the Internet/digital segments. Since social media and networks, such as Facebook, and social gam(bl)ing are becoming more and more important, we again include analyses of activities and successes of lotteries in social media. Sales-related benchmarks – Total sales and product-related sales (e.g., lotto, betting, instant, …) benchmarks, such as per-capita sales analyses. Internet/digital segments and channels – The report offers many analyses of the Internet/digital segments and channels, users, …. We have also included comparisons to private Internet gambling companies. Social media and networks benchmarking and success stories – In-depth analyses of the social media activities (Facebook, Twitter, YouTube) of lotteries. Marketing benchmarks, such as marketing/advertising expenses in % of total sales. Operating expense benchmarks, such as operating expenses in % of sales broken down into human resources (e.g., average personnel expenses, sales per employee), IT and communications, and other benchmarks. Large number of lotteries analysed and most up-to-date information – Analyses of data from ca. 130 state/public lotteries and operators for the years 2017 and 2016 as well as long-term trend analyses. In total, the report has 56 pages and 49 graphs/exhibits.